While previous governments now have admitted that many persons are missing, it was claimed that most of them had crossed the border into Pakistan to become militants.Under International Humanitarian Law,it is a crime because the previous innumerable cases have not been solved or even filed and the tradition of continual disappearances in Kashmir continues. 'Unmarked graves' in Kashmir are deemed as 'unidentified foreign militants' by the Government of India-- who in reality were picked up by Indian Armed Forces,killed in custody and then falsely identified as foreign militants.In many cases, when relatives have succeeded in their demand to have graves exhumed, their claims have been found to be correct.People are not bitten by wild monkeys when they come out on streets.People don't protest for fun but it is actually the 'failure of deliverance' which drives them out of their homes. According to Association of the Parents of Disappeared Persons (APDP),Srinagar,"Our report alleges that more than 8,000 persons have gone missing in Jammu & Kashmir since 1989.Since 2006, the graves of at least 940 people are reported to have been discovered in 18 villages in Uri district alone.The existence of multiple graves which, because of their proximity to Pakistan controlled-areas, are in areas not accessible without the specific permission of the security forces. 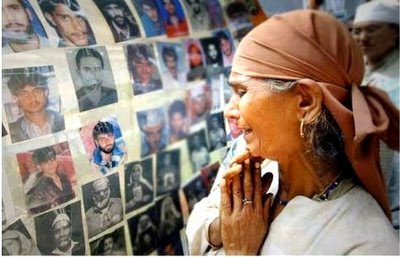 The Indian authorities put the figure at less than 4.000, claiming that most of these went to Pakistan to join armed opposition groups.A state police report confirmed some deaths in custody of 331 persons, and also 111 enforced disappearances following detention since 1989". Tariq Ali, an eminent British intellectual wrote an article on London Review of Books where he stated, "An Amnesty International letter to the Indian prime minister in 2008 listed his country’s human rights abuses in Kashmir and called for an independent inquiry, claiming that ‘grave sites are believed to contain the remains of victims of unlawful killings, enforced disappearances, torture and other abuses which occurred in the context of armed conflict persisting in the state since 1989. The graves of at least 940 persons have reportedly been found in 18 villages in Uri district alone.’ A local NGO, the International People’s Tribunal on Human Rights and Justice in Indian-Administered Kashmir (IPTK), states that extrajudicial killings and torture are a commonplace in the valley and that Western institutions don’t even try to do anything about this for fear of damaging relations with New Delhi. The figures provided by the IPTK are startling. It claims that the Indian military occupation of Kashmir ‘between 1989-2009 has resulted in 70,000+ deaths’. The report disputes claims that these killings are aberrations. On the contrary, they are part of the occupation process, considered as ‘acts of service’, and leading to promotion and financial reward (bounty is paid after claims made by officers are verified)." In December 2009 International People's Tribunal on Human Rights and Justice in Indian Administered Kashmir (IPTK) in collaboration with APDP produced another report called, "Buried Evidence" (www.kashmirprocess.org) in which IPTK has put the number of unmarked and massgraves at 2700 (having 2943 bodies) in Baramulla, Kupwara and Bandipora Districts. Unlawful killings,draconian-like laws,arbitrary arrests and high levels of torture are direct violations to international humanitarian laws and are viewed as international crimes-To which State of India is a party.The extraordinary license of 'shoot to kill' is renewed with installation of every new government.The failure to deliver justice where the agencies have found that criminal acts have occurred,is an obvious indictment of all draconian powers including 'Armed Forces (Jammu & Kashmir) Special Powers Act' and 'Disturbed Area Act. '.We should salute the efforts of all Human Rights defenders who have silenced all uncivilized critics and have helped the society by exposing these barbaric facts to a higher degree. A)Immediately install a 'Truth Commission' in accordance with international humanitarian standards to inquire into serious violations by Security Forces for investigations regarding all disappearances and killings. B)Revoke all laws enacted such as DAA,PSA and AFSPA which authorize excessive use of force beyond the limits of Human Rights Protection bodies. C)Strengthen State Human Rights Commission.The state and national governments should take appropriate 'action' based only on the commission's recommendations. D)Immediately respond to requests for necessary measures to ensure the protection of human rights defenders and civil society activists. E)Strengthen and enforce laws and policies that protect detainees from brutal torture and other mistreatment. Installation of the Truth Commission would clarify incidents of killings,torture and disappearances in order to build a robust record of abuses by institutionalizing responsibility.It will identify individuals at senior levels who were involved in planning and executing such abuses.Governments here suffer from a 'conflict of interest' that has led to omitting of key perpetrators and embezzling evidence during investigations.In order to confuse,these cruel fakes participate in intimidation of witnesses and complaints and other questionable practices.There have been unfair evidential burdens which families face in proving 'disappearances' and extrajudicial executions because the State Government exclusively controls the 'evidence archives' necessary to prove violations-which it rarely turn over.Officials & Bureaucrats in Kashmir are champions in shifting the burden of proof to refute the allegation of violations.Harassment has immorally imitated witnesses which has caused complainants to withdrew cases after repeated abuse. A)Free admissions in Schools,Universities,Colleges & Special Provisions in Job recruitment. B)Health Assistance for physical and mental harm incurred by victims and their families. C)Expunge criminal records of false cases filed against victims and their family members. D)Develop memorials that commemorate and acknowledge innocent victims of the counterinsurgency abuses. E)Determining the 'final fate' of disappeared and killed. There should be a 'genuine course of action' which should meet obligations to investigate violations by taking appropriate measures ensuring that those suspected of criminal responsibility are prosecuted and duly punished. People have been struggling for truth and justice since late 1980's. A long lasting peace perhaps would be the biggest tribute to families who have been victimized through violence. People should build intense pressure for action to raise the cost of human rights abuse.